Few operas by a major 19th century composer have experienced comparable neglect. 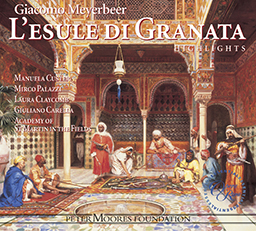 L’esule di Granata deserves our attention as a pivotal work in Meyerbeer’s output. Few operas by a major 19th century composer have experienced comparable neglect. The fifth of six operas Meyerbeer wrote for Italian opera houses during his nearly nine years in Italy (1816 to 1824), L’esule was apparently produced only once following its 1822 premiere at La Scala, Milan (in Florence four years later), and thereafter remained silent until now. L’esule di Granata deserves our attention as a pivotal work in Meyerbeer’s output. While Meyerbeer clearly embraced the innovations of Rossini he also managed to make many others to accommodate his own musical ideas. The most significant of these was the concept of scale, We see this in the complex, multi-movement introduction which makes up the first scene of L’esule di Granata. 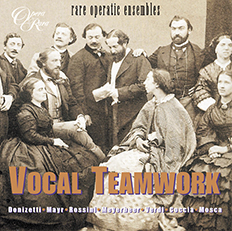 From the moment the curtain rises, he is already working on a larger canvas, employing all the effects at his disposal – choruses, stage bands, scenic effects, and above all, brilliant vocalism.Ironically, it is the singers produced by today’s so-called “Rossini Renaissance” that have enabled Opera Rara to investigate the vocal splendours and challenges of Meyerbeer. L’esule di Granata is no exception and none of the cast on this recording will disappoint. 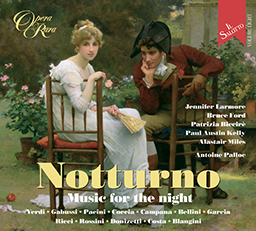 This is the third opera in the Essential Opera Rara series and once again a vivid impression of the opera is captured on a single disc, accompanied by a complete libretto and article. 03 L’esule di Granata: Act I scena I: Introduzione: Si, vendetta ? pera ? cada ? 04 L’esule di Granata: Act I scena I: Introduzione: Ma silenzio ? 07 L’esule di Granata: Act I scena I: Duetto: Deh, se il padre consoscesti – scena II: Torna il prode ? 13 L’esule di Granata: Act II scena II: Scena: All’armi, all’armi! 14 L’esule di Granata: Act II scena II: Scena: Si, guerrieri – si, miei fidi ? 15 L’esule di Granata: Act II scena II: Aria: Se lo difende amore – scena III: Inoltra il passo ? 16 L’esule di Granata: Act II scena III: Duetto: Il trono avito io non pretendo ? Prior to the action of L’esule di Granata, Suleiman (Sulemano), a member of the Abenserage family and king of Granada, was driven from the throne by the rival Zegri family, which installed Boabdil as king. At the latter’s death following a ten-year reign, the crown passed to his son Almanzor, who has attempted a rapprochement with the Abenserages and has chosen Azema, Suleiman’s only daughter, as his bride. Meanwhile, Suleiman, having learned that Azema is still alive, has returned in disguise to Granada to rescue her from the Zegris. Act One, scene 1. On a riverbank near the gardens of the Alhambra, with a mosque opposite, Ali and groups of Zegris opposed to Almanzor’s policy of tolerance plot against him with their leader Alamar. They retreat as Azema and a group of Abenserages women, first from within the mosque and then onstage, implore heaven for the safe return of Almanzor after his fight with the Spanish. The Abenserage leader Omar and troops arrive with news that Almanzor has triumphed. When all have departed, Suleiman comes down from the mountains and hails his native soil. Hearing a group of maidens extolling Almanzor’s bride, he is appalled to learn from Fatima, Azema’s lady-in-waiting, that the bride is his own daughter. Without revealing his identity, Suleiman tells Azema that the Zegris killed her mother and brothers when she was an infant and chides her for agreeing to marry a Zegri. After Azema leaves, Fatima agrees to help Suleiman meet her again. Act One, scene 2. In the throne room of the Alhambra, the people await Almanzor’s imminent return. He enters with courtiers carrying the spoils of war and declares that peace is more important than the palms of victory. Azema crowns him with a garland, and the two prepare to marry. Act One, scene 3. In the Alhambra’s Courtyard of the Lions, Suleiman, having been admitted by Fatima, meets Azema. Shedding tears of happiness, he reveals that he is her father, but their rapture is cut short when he forbids her to marry a Zegri and vows to kill Almanzor otherwise. Interrupting them, Almanzor is surprised to find a stranger in the palace, but Azema describes Suleiman as a relative of her mother. Azema is torn between her love for Almanzor and her father’s demands, as Omar announces that the time for the nuptial ceremony has arrived. [Act One, scene 4.] [Should this be designated as a new scene? It is not in the libretto prepared.] When the people have assembled for the wedding, Almanzor enters with Azema and bids them rejoice. She trembles as he leads her to the altar and asks her to be his wife. Observing a threatening gesture from Suleiman, Azema declares “no,” to general astonishment. When she declines to speak further, the people infer that she is unfaithful to Almanzor, who orders her from his sight. All but Suleiman and Alamar bewail the turn of events. Act Two, scene 1. On a riverbank near the Alhambra, Moorish maidens and Abenserage worriers lament the turn of events when they are interrupted by Omar, who announces that the royal wedding will occur after all. An exile and friend of her family, Omar explains, brought Azema sad news of her father, which upset her; now the king has consoled her. Alamar overhears the news and calls for bloodshed, but Ali informs him that among the Zegris no one is willing to murder the king. Alamar notes that he observed an old man muttering threats to the king and Azema and has called him for questioning. Suleiman enters and confirms his willingness to slay Almanzor. He and Alamar agree that the deed will be done at nightfall, while Ali, left alone, is torn between wanting to protect the king and fearing for his own wellbeing. Act Two, scene 2. In an enclosure in the gardens of the Alhambra, Azema bids her handmaidens good night. Left alone, she remains troubled by thoughts of her offended father. Fatima announces that a Zegri warrior demands admittance, whereupon Ali discloses the plot on Almanzor’s life. Abenserage warriors are summoned, as Azema declares that she will be the first to confront the Zegris’ blades. As she prepares to go, Almanzor enters and learns from Ali of the plot. The king notices Azema’s alarm at Ali’s description of the assassin, and she admits that he is her father. Act Two, scene 3. In the throne room, Alamar discusses plans for the assassination with Suleiman and leaves. Almanzor, without disclosing his identity, tells Suleiman that, even though Azema has revealed his secret, the king nevertheless offers friendship. Sensing Almanzor’s identity, Suleiman makes a hypothetical plea to the king: I would ask him not for my ancestral lands, but only for my daughter. Alarmed, Almanzor offers a hypothetical reply: take the throne, but do not rob me of my treasure. As tension rises between the two, Suleiman makes a vain attempt on Almanzor’s life and is put in chains, Almanzor vowing to treat him mercilessly. Act Two, scene 4. In the Courtyard of the Lions, Almanzor regrets the harsh fate he has prepared for Suleiman when Omar announces that the high court has signed the death sentence. Azema enters and demands that Almanzor either spare her father or execute her too. Almanzor pardons Suleiman and the other conspirators and allows the former monarch to depart with his daughter. Moved by Almanzor’s magnanimity, Suleiman embraces him as son-in-law, as all hail the power of love.